MadToppings uses their own specialised couriers to deliver their food. Mad cream sauce, caramelised onion, butter chicken, red chilli pepper and mozzarella cheese topped with spring onions. Stringy mozzarella cheese in a garlic and herb breadcrumb. “Simply magic” - Tomato herb sauce, pepperoni slices and mozzarella cheese. “Beef with bite” - BBQ sauce, beef, Spanish onion and mozzarella cheese. “Yummy Hammy” - Tomato herb sauce, smoked ham and mozzarella cheese. “Classy taste” - Tomato herb sauce and mozzarella cheese. “Simple…classic…tasty” - Tomato herb sauce, diced tomato and mozzarella cheese topped with oregano. “Vegetarians beware! !” - BBQ sauce, smoked ham, pepperoni slices, Italian sausage, beef, bacon and mozzarella cheese. “What can we say? Every kid's favorite” - Tomato herb sauce, smoked ham, pineapple and mozzarella cheese. “Simply splendid” - Tomato herb sauce, pepperoni slices, Italian sausage, bacon, mushroom, capsicum, Spanish onion, pineapple and mozzarella cheese topped with oregano. “Aussie Love" - BBQ sauce, roasted chicken, mushroom, Spanish onion and mozzarella cheese. “Discover a new taste” - Mad cream sauce, bocconcini cheese, feta cheese and mozzarella cheese topped with spring onions. “Another ripper” - Tomato herb sauce, spinach, diced tomato, Spanish onion, capsicum and mozzarella cheese. BBQ base, Italian sausages, free-range eggs and mozzarella cheese. Tomato sauce base, sweet corns and mozzarella cheese. “Seriously hot! Seriously nice! (I need a drink! )” - Tomato herb sauce, roasted chicken, caramelised onion, capsicum, jalapeños, red chilli pepper and mozzarella cheese topped with mad peri-peri sauce. 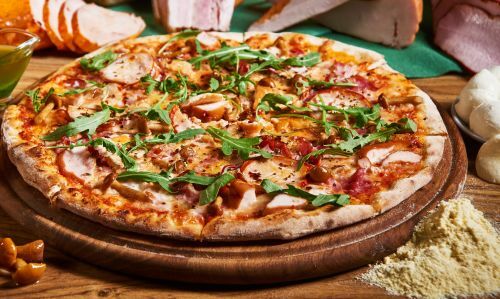 “Addictive flavour” - Tomato herb sauce, garlic sauce, roasted chicken, caramelised onion, sun-dried tomato and mozzarella cheese topped with mad pesto sauce. “Masterpiece” - Mad chilli sauce, garlic and ginger, roasted chicken, Spanish onion, capsicum, jalapeños, chilli flakes and mozzarella cheese topped with fresh coriander and mint-avocado sauce. “The tradition continues” - Mad cream sauce, garlic sauce, Afghani seasoning, roasted chicken, mushroom, caramelised onion and mozzarella cheese topped with spring onions. “Transporting the taste of Mexico” - Mad chilli sauce, Mexican spices, capsicum, beef, Spanish onion, sun-dried tomato, jalapeños, chilli flakes and mozzarella cheese. “The best of the sea” - Mad cream sauce, garlic sauce, prawns, caramelised onion, spinach, diced tomato and mozzarella cheese. “Good karma never tasted so good” - Tomato herb sauce, garlic and ginger, capsicum, mushroom, Spanish onion, sun-dried tomato, spinach, jalapeños, olives and mozzarella cheese topped with coriander. “Funky for your taste buds” - Mad cream sauce, garlic sauce, caramelised onion, diced tomato, vegetable Manchurian, chilli flakes and mozzarella cheese. “Sensationally awesome! Ticks all the boxes” - Mad chilli sauce, garlic and ginger, paneer (cottage cheese), Spanish onion, capsicum, jalapeños, chilli flakes and mozzarella cheese topped with fresh coriander and mint-avocado sauce. BBQ sauce, shredded ham, rasher bacon, free-range eggs topped with mozzarella cheese. Pesto sauce base, spinach, sun-dried tomatoes, mozzarella cheese, feta cheese and olives . Pizza sauce , caremalised onions, capsicum, marinated chilli mushrooms , mozzarella cheese , roasted red peppers and jalapeño. Pizza sauce base, onion, fire roasted capsicum, sun-dried tomato, mushrooms, olives and sliced avocado. Pizza sauce base, onions, fire roasted capsicum, mushroom, marinated chicken and sliced avocado. BBQ sauce base, onion, capsicum, minced lamb, chilli flakes and jalapeño. Creame sauce base , caramelised onions , red cherry peppers , marinated creamy cottage cheese ( paneer ) topped with mozzarella cheese and chilli flakes. “The perfect partner to a pizza”. All Special Sides served with MAD special sauce. Jalapeño filled with cheese in a crisp nacho breadcrumb. Marinated and seasoned breast chunks coated in a spicy breadcrumb. Marinated chicken breast with classic crispy coating with choice of your dipping (BBQ, Hot, Avocado or Sweet Chilli). 10 pieces. Choose your flavour. 10 pack chicken wings in different flavours. Chicken wings, chicken chunks, chicken tenders, jalapeño poppers and mozzarella sticks served with your choice of dipping sauce (BBQ, chilli, or peri-peri). Nutella base, choc brownies, banana, strawberry topped with chocolate sauce and icing sugar.